Feeling the white pristine sand filter through your toes as you stare at a breathtakingly beautiful shoreline is the dream of millions of people. With the ease of air travel and increased globalization, one of the world’s fastest growing industries is tourism, and its subset, ecotourism. Many people are opposed to the large waves of tourists that invade their area a few times of the year; however, this also strengthens the economy of a country. With large number of tourist also comes the problem of accommodating them and their needs. I have been thinking about this lately since we have not only been students in India but also tourists. We have currently visited 6 cities in India, and we will visit countless more. As a student and practitioner of sustainability, I have been thinking about the impact that our small group has had on the environment where we have toured. Last week we visited part of the Indo-Burma biodiversity hotspot: the Andaman and Nicobar Islands located in the Bay of Bengal, almost 1,400 kilometers east of India’s mainland. There we participated in two different ecotourism tours to look at coral reefs at North Bay Beach and Red Skin Island. According to the Nature Conservancy, ecotourism is travel that is done in an environmentally responsible way so that the tourists can enjoy nature in a low impact manner while promoting conservation. Ecotourism over the last years has increased because people have a strong desire to experience the most remote parts of the world, as our curiosity is never-ending; however, this exploration should be done in a way that doesn’t impact the natural environment. Therefore, in response to people wanting to explore more of the natural world a new kind of travel was created. However ecotourism, which lessens the environmental impact but does not completely eliminate it, is not widely implemented since most tourism in natural areas is not eco-friendly. Therefore, as tourism increases in natural areas and damaging tourism practices are implemented it can negatively impact the ecosystem as well as the surrounding communities. 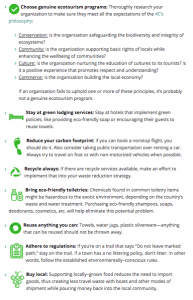 What are the advantages of ecotourism? The primary reason why many countries are in favor of ecotourism, especially developing countries, is due to the fact that ecotourism can improve local and national economies. People in the local communities around the natural area will have new job opportunities, better incomes, and improved infrastructure to accommodate the tourists. Ecotourism promotes conservation and education for tourists, the human community, and researchers. People are able to explore a mostly untouched area of the world while learning about the ecosystem and how to conserve it and specific species. Therefore this creates more awareness and hopefully the information they have gathered on their travels can be spread and used in their daily lives. The human community is additionally positively impacted since the growth in consumption of local foods and artisanry brings in more economic earnings. This means that ecotourism promotes the cultural traditions of the area instead of altering it for the tourists. In addition, when people take part in ecotourism some of the money that they spend not only goes back into the local economy but is also used for conservation efforts in the area. The most commonly used conservation project are reforestation and protection of endangered species. This in turn also protects the natural resources in that area. Economic activity typically involves the exploitation of natural resources. Ecotourism seeks the opposite; it establishes sustainable boundaries by identifying and implementing a limit on how much usage a natural resource or environment can be utilized before it harms the environment. Coral Reef at North Bay. Taken by Kassidy Hadley. What are the disadvantages to ecotourism? Even though there will be an increase in the economy the locals are usually prohibited from using the natural area for their livelihoods. The people may have used the habitat for hunting, foraging, using the raw materials for shelter, or for religious practices. Even though ecotourism attempts to reduce the impact of regular tourism, the natural areas are still open to people which many conservation biologists are against because it could have significant detrimental impacts on the environment. Not only is the environment at stake but also indigenous people; the fragmentation of their lands with roads and infrastructure can change their livelihoods as well as their culture. This can be seen in the Andaman and Nicobar Islands with the construction of new infrastructure for tourism like the Andaman Trunk Road that goes straight through the island and through the Jarawa territory, a native tribe that lives in the islands. This has changed their livelihoods according to a discussion held at ANET, Andaman and Nicobar Environment Team. People tour the Trunk Road in hopes that they encounter the tribes’ people and then proceed to feed them cookies and take pictures of them. An ANET team member mentioned that the tourists treat them like monkeys at the zoo. The tourists make them an attraction but by doing this they are shifting their culture since they are interacting more with the outside world. Moreover, ecotourism is supposed to be less environmentally degrading; however, sometimes degradation can be caused by it since it usually takes people to remote areas where there is not much previous human impact. This can lead to an ecosystem shift by changing the predator-prey relationship since prey maybe be scared off by human presence. Ecotourism can also lead to a higher demand on food, water, and waste system infrastructure that further stresses the environment. Mode of Transportation to North Bay Beach. Photo Taken by Heather Lowe. 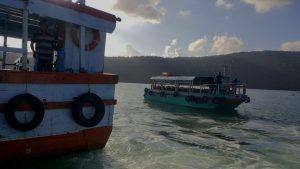 Last week the group took a 20-minute boat ride from Port Blair, the largest city on South Andaman Island, to North Bay beach. Here I was able to see the destruction that ecotourism creates; this is a hypocritical perspective since I too was partaking in the ecotourism, but at the same time I was aware of my impact and observing the impact of the tourism on the environment. The big 50-passenger boat that took us to the island docked 30 meters from the shore, and this proximity may have caused damage to the corals. 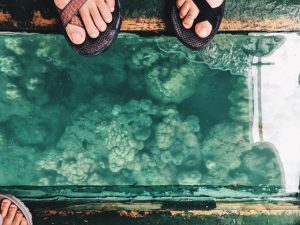 There was a wide range of activities that the tourist could do on the island: snorkeling, scuba diving, underwater walk, and a glass bottom boat tour. The group decided to do the glass bottom boat, and we were highly disappointed by what we saw. The first question that was asked was, “why aren’t the corals colorful and where are all the fish?” These are two of the most obvious observable indicators of the health status of a coral reef. Bleached Coral Reef Seen Through a Glass Bottom Boat. Video taken by Kassidy Hadley. Dr. Paradise explained the impact of tourism on coral reefs. Some of the biggest ones are increased siltation due to terrestrial development or human activities in the water. This does not allow the algae to photosynthesize and provide nutrients for the coral polyps. The divers and snorkelers were going out in waves into the water; the positive aspect of this activity is that it was done in a designated area and the tourists weren’t able to go to other parts of the reef. In addition to this there was a problem with the wastage disposal on the island; there were plastic bottles and wrappers on the island and in the water. There was no environmental education on the island so many people were throwing their trash wherever and not worrying about their impact on the environment, which is an aspect of ecotourism that the beach lacked. In addition, there was a large amount of water pollution, not only from sewage but also gasoline leakages from the boats. This is a further stressor on the reefs. Overall the coral reef that we saw off North Bay beach was bleached, a fact that the National Institute of Ocean Technology of India has been monitoring. 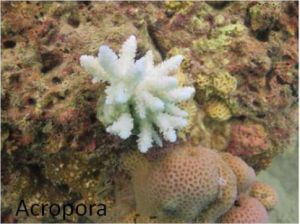 Bleaching happens when a stressor is introduced into the coral reef, which could be a disease, temperate increase, salinity increase, or siltation increase. I also took part in ecotourism when I visited the Mahatma Gandhi National Marine Park, which was created in 1983 under the Wildlife Protection Act of 1972 to protect coral reefs and nesting sea turtles. I took a 45 minute public bus to the park and then a small boat to Red Skin Island. This was one of the two sites for snorkeling, the parks switches between two islands depending on the time of year to let the coral regenerate and lessen the impact of ecotourism in the area. When the boat reached its destination we docked 500 meters away from the shore on a buoy, and we disembarked from this large craft onto a smaller boat that would not harm the coral reef. 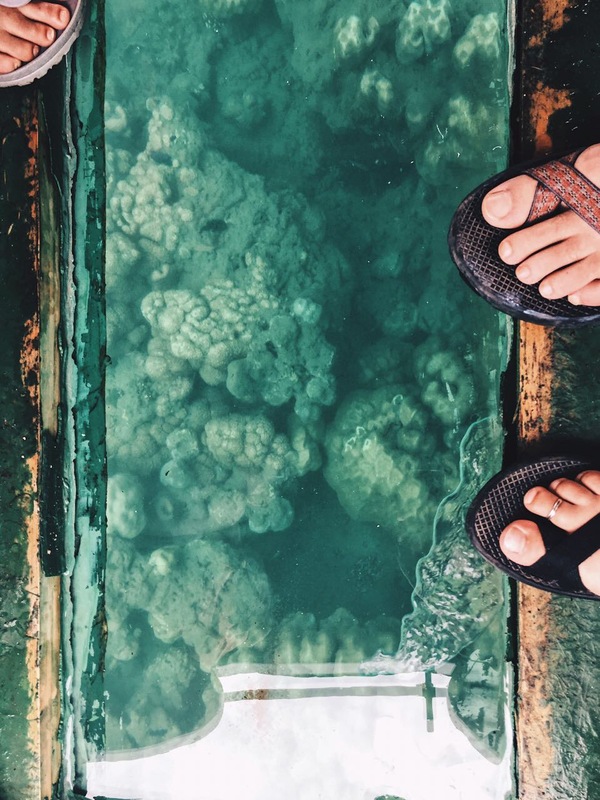 We rode on the glass bottom boat for 10 minutes before going to shore, I immediately saw the difference between the reefs that we saw in North Bay to the reef in the marine park. Even though it wasn’t a “finding Nemo” kind of coral reef it was a lot more alive and healthy than what we saw in North Bay. We saw different varieties of fish and corals, even though the corals weren’t as colorful as I imagined you could clearly see that they were healthier and not as dull or bleached as in North Bay. The fish also ranged in size, which was not seen in North Bay, where most were small; in addition they clearly used the coral reef as a habitat. Scuba Diving in North Bay Beach Area Where There Is Little Human Impact. Video taken by Steven Sorrell. I Saw Similar Organism on My Snorkeling Trip in the Marine Park. The only degrading activity that I witnessed in the marine park was when I partook in the snorkeling activity that was offered. A guide went with me. Instead of swimming over the coral he stepped all over them and then urged me to touch some of the coral; according to Dr. Paradise this might stress the coral and eventually kill it. I touched it once and immediately regretted it when I realized that this would negatively impact the environment. However, I was able to observe how the fish used the finger coral and other types of plants as a safety barrier between them and us. Overall the ecotourism that was conducted in the marine national park was more eco-friendly and offered more education for the tourist than the North Bay beach area. And with the definition of ecotourism, taken from the Nature Conservancy, the marine park fully completes all of the characteristics that ecotourism seeks to achieve. Paradise, Chris. “Coral reef ecology, reef pollution, and conservation of reefs” Presentation at Sun and Sea Resort, Port Blair, Andaman Island. 19 October, 2017.